It isn't often that a New York Times-bestselling author drops by my corner of the blogosphere. In fact, of my 837 posts, this is the first time it's happened. 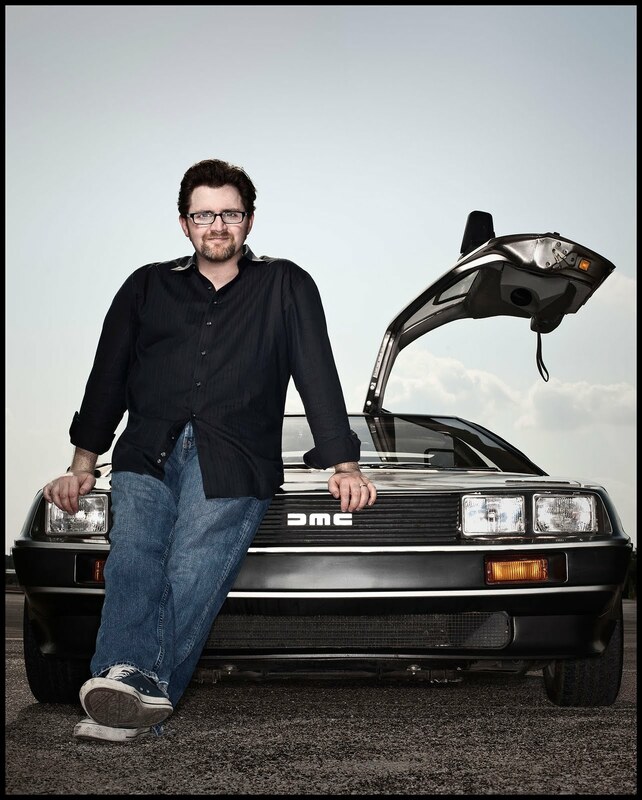 Today, I welcome author Ernie Cline, who's building a nice little resume after penning the movie Fanboys and now his first novel, Ready Player One. Mr. Cline was gracious enough to join me for an interview, but first let me throttle his book in my review. Ready Player One takes us to a grim future where the Great Recession never ended. Humanity has grown complacent and watched the world fall to pieces. Thankfully, people have a place to escape from all of this: the OASIS. It's World of Warcraft on Venom (Bane's Venom, mind you). Or Second Life, but only awesome and with an actual purpose. The OASIS is the ultimate media-converged virtual world where anything is possible. Like the Matrix, without the people-as-batteries thing. The book follows Wade Watts, a teenager searching for a better life. Wade, like everyone else, spends the majority of his time interacting in the virtual world. Through his avatar Parzival (the other spellings were already taken), he makes friends, goes to class, and basically eats and breathes a simulated world that's much better than actual reality. The OASIS world was created by a reclusive billionaire named James Halliday, a mystical Steve Jobs-like figure who enjoys an almost cult-like following. A child of the eighties, Halliday relished video games, movies, and sci-fi and fantasy, incorporating them into his life and basing entire "sectors" of the OASIS on things ranging from Blade Runner to Star Wars and Dungeons & Dragons. Upon his death, Halliday buried an "Easter egg" deep in the bowels of the virtual world program, vowing that anyone who found it would inherit the OASIS and all his wealth. The Hunt spawns an entire subculture of online egg hunters (called "gunters" in the book) hellbent on finding Halliday's Easter egg and claiming the wealth, power, and privilege that would surely follow. The gunters and their freewheeling ways are threatened by a corporation called IOI (its agents are called Sixers) that employs vast numbers of people and resources to solve Halliday's riddles. If they win and take over the OASIS, it would surely result in a grim future full of microtransactions, subscription fees, and general corporate greed. Wade becomes the first person ever to crack one of Halliday's clues, leading him down a virtual rabbit hole of eighties movie, music, book, and game references. Each clue becomes more and more vital, each reference more and more obscure as Wade and his friends Art3mis and Aech try to stay a step ahead of the IOI and its never-ending supply of goons. Other than a little hyper-competitiveness and mutual antagonism, they're mostly up to the challenge. Watch out for giant robots, X-wings, flying DeLoreans, arcade showdowns, and a little RPG magic. Ready Player One plunges readers into an OASIS of their own where anything is possible and even the little guy has a shot at the high score. -bad guys were a little stock-quality, "evil for evil's sake"
Ready Player One is a seriously entertaining read. If you love the eighties, pop culture, video games, and imagination, READ IT NOW. If you don't love any or all of those things, I'll admit the depth of movie, book, and gaming references could be deep and intimidating. QUESTION: Your book is steeped in geek culture. I'm sure you knew most of it going in, but did you have to research any of it? Which areas of geekdom required a little extra effort? ERNIE CLINE: I didn't really do any research into the geek culture elements, unless you count my entire life prior to writing the book as "research." I only referenced things from my own life, as a way of maintaining my own interest in writing the book. I did occasionally look things up online, but only to make sure I was remembering something correctly. Most of the real research I did for the book involved studying virtual reality technology and haptics. QUESTION: The OASIS seems to be the next evolution in gaming/roleplaying. How close do you think we are to the total immersion shown in Ready Player One? ERNIE CLINE: It's difficult to say. We've been promised "virtual reality" since the 80s, but the technology still isn't quite there. We still play video games and browse the web on two-dimensional screens. But it seems like we're inching closer to something like the OASIS every day. The US military is constantly developing more and more advanced VR tech, as a way to train soldiers to deal with combat situations in a consequence-free environment, and haptic technology is also getting more and more advanced. It seems likely that sometime in the next few decades, something like the OASIS will emerge. If it does, I think an awful lot of people will become addicted to it. QUESTION: The book has so many nods and references, and then the OASIS itself has its own set of rules. How did you keep it all straight? Did a series "bible" figure into your world-building? Did you "map" out the different realms/sectors found within the OASIS? ERNIE CLINE: The first few years I spent working on the story, I spent most of my time filling notebooks ideas and details about the OASIS and how it would work. I did create a map of all the OASIS sectors, while I was sorting out how travel within the simulation would function, and how each sector would be divided up into zones with different properties. It took me a long time to figure everything out, but it was necessary to get all of those details clear in my mind before I could begin to tell the story. QUESTION: What were the struggles of seeing the book in print? How long has the process taken? ERNIE CLINE: The main struggle for me was just finishing the book. I took me nearly a decade, working on it off and on between various day jobs and screenwriting projects. I would get frustrated and set the novel aside, sometimes for a year or more, before finally coming back to it for another try. Eventually I sold the option to one of my screenplays, and that allowed me to quit my day job and just focus on finishing the novel for a year. That was when I finally finished it, in late 2009. Once the book was finished, it only took me a few months to find an agent and sell it to a publisher. QUESTION: What (or who) are some of your writing inspirations? ERNIE CLINE: A lot of writers inspire me, and many of them are mentioned in my book. I'd say my three biggest influences are Douglas Adams, Kurt Vonnegut, and Neal Stephenson. BONUS QUESTION: What's your next project/what are you working on right now? ERNIE CLINE: Right now I'm working on a geeky coming of age movie about growing up in the 80s, in the spirit of American Graffiti and Dazed & Confused. I'm writing the screenplay and I also plan to produce and direct. Wish me luck, because I'm going to need it. ALL TOGETHER NOW: GOOD LUCK, ERNIE! He drives a DeLorean. For real. Well, sort of. I read the book via a library loan on my Kindle. Interview conducted via email. I would like to again thank Ernie for his time!